A bunion is a condition resulting in boney prominence at the inside of the foot at the big toe joint. A bunion occurs when the big toe begins to deviate toward the second toe. The biggest misconception is that bunions occur from an overgrowth of bone. While that may be true in very few people, the bunion really represents a dislocation of the big toe joint as it bulges against the skin.Bunions come in a variety of sizes – from small to severe. In some cases, the big toe may push against the second toe, and may result in pain and a hammer toe, or progress onto a severe disfiguring foot deformity. See Dr. Blitz Bunion Scale – published in the Huffington Post. Depending on your overall health, symptoms and severity of the bunion, the condition may be treated conservatively and/or with surgery. 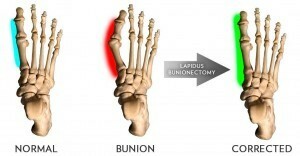 The Lapidus Bunionectomy is a type of corrective Bunion Surgery that involves restoring the natural position of big toe joint by structurally relocating the malaligned metatarsal back to its native proper position. This is done with a bone mending procedure of two bones at the instep that are often too flexible, which contribute to the bunion forming in the first place.Dr. Blitz typically recommends the Lapidus procedure for patients with moderate, large, severe or recurrent bunions. Dr. Blitz’ advanced techniques and protocols, published in the Journal of Foot & Ankle Surgery, have revolutionized bunion surgery because it allows patients bear weight immediately after surgery in a stiff soled surgical shoe. Dr. Blitz’ developed a provisionally patented medical device that holds the bones steady during the healing process, which has allowed nearly all patients to bear weight on the foot immediately after surgery. This technique has been called the “Early Walking Lapidus Bunionectomy.” Historically, larger bunions called for casting and crutches, but Dr. Blitz’ techniques and protocol have allowed patients to get back on their feet fast (without the need for crutches or casting). Dr. Blitz is the creator of the Bunionplasty® procedure, which is a cosmetic (or aesthetic) approach to bunion surgery where special plastic surgery techniques are used to hide, minimize or limit incisions. Dr. Blitz combines his Bunionplasty® procedure techniques with the Lapidus Bunionectomy by performing both hidden incisions and plastic surgery closure. The visual appearance of the foot is of utmost important to Dr. Blitz. Inserting surgical hardware is a necessary part of the Lapidus Bunionectomy. The purpose of the fixation is to stabilize the bone while the bones mend solid. Common hardware involves screws and a plate. Either surgical stainless steel or titanium is used. Dr. Blitz’ commonly performs the Lapidus Bunionectomy using the titanium implant he developed in conjunction with a leading orthopedic device manufacturer. Dr. Blitz’ holds a provisional patent on the device. This product (Contours Lapidus Plating System – www.contourslapidus.com) is used by surgeons nationally because of its unique features, innovative design, and ability to get patients moving faster. Surgically hardware can remain in your foot permanently. Some patients choose to have the hardware removed simply because they want it out, or if it is irritating the skin from underneath. Dr. Blitz’ innovative Lapidus Plate was designed to avoid irritating foot, and hardware removal is extremely uncommon. • Overall Experience: Dr. Blitz has over 12 years of major experience in the field. He is considered an international expert in bunion surgery. • Peer-reviewed and General Publications: Over that past decade Dr. Blitz has published dozens articles, case reports, and letters in scientific journals on a variety of topics. Dr. Blitz has published in the Journal of Foot & Ankle Surgery, Achieves of Plastic Surgery, Clinics in Podiatric Medicine & Surgery, Podiatry Today, Huffington Post and the Mount Sinai Journal of Medicine. • Lecturer: Dr. Blitz has a solid history of lecturing on Lapidus bunion surgery.